Job interviews are nerve racking situations and the more nervous an applicant may be, the more it may affect your body language and behavior in a negative way. Interview body language is an incredibly vital aspect of getting a job and in this article we will try and calm your nerves by helping you to implore good interview body language habits and communication. Body language is a means of communication within itself. It communicates how you are feeling, your confidence and gives an employer an insight in the person you are and what you would benefit to their business. There are certain job interview body language methods and tips that you should follow to help you get the position you really want. Posture is an incredibly important aspect in interview body language. When you take your seat, sit upright but not in a stiff manner. This will indicate that you are comfortable. If you are hunched down in your chair, this will communicate that you do not have much confidence in your interview body language. A sloppy posture gives the impression of laziness which is an obvious negative. Sitting on the edge of you chair may come across as if you are nervous. In great interview body language tips, sit relaxed and upright and lean forward somewhat towards your interviewer. This will communicate that you are interested and engaged in the conversation. You should not fidget with your hands while the interview is being conducted. You should place them in your lap or in front of you. Keep your hands away from your face. Interviewing specialists will tell you that touching your nose or lips shows that a candidate is being untruthful. Another interesting finding in job interview body language is that if one holds their hands or arms behind or above their head, it expresses that they are annoyed or uncertain. Folding your arms in front of you communicates a defensive stance and when it comes to the movement of your legs, they should stay calm with not a lot of movement which expresses a calm demeanor. 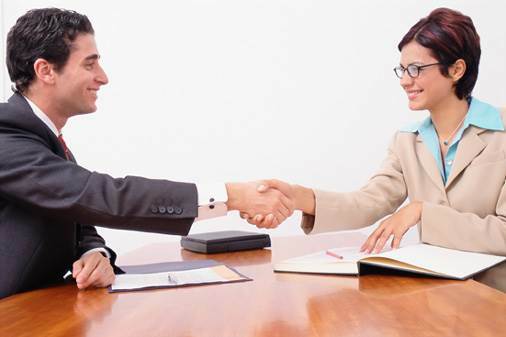 Eye contact is an important aspect of body language during an interview. You should constantly maintain eye contact throughout the interview. Direct eye contact communicates that you are active at listening and participating in the conversation at hand. You may indicate that you are understanding or agreeing with the statement of the interviewer by nodding your head. In great interview body language tips, the way in which you speak and the tone and pitch you use also communicates various things to the employer. Avoid speaking in a boring monotone by varying your pitch and tone but do not become too agitated either. Speak clearly and directly and do not babble. Be concise and direct in your answers. We wish you the best of luck when going for your interview. Be confident in yourself and follow these fundamental interview body language tips and you should get the job. Jemma Scott is an avid writer of diverse careers and in this article looks at the importance of body language in an interview. Her interest and information on this topic stems from her time working for a professional interpreter that practiced as a certified translation specialist.